This week our Etsy shop comes to us from Dawn in Wisconsin. I first met Dawn over at our longtime stomping ground Stylethread, a fantastic forum for all things fashion. It was there we got to see Dawn transform her designs from accessories that she made as a hobby to a pretty little shop on Etsy! I am so happy to introduce you all to Daisy Petal Designs so that you can see the hair accessories and jewelry Dawn creates. And the youngest members of your family need not be left out as Dawn has a new shop, Littlest Blooms, which caters to babies and little girls. Always available for custom work, just send a convo to Dawn if you see something you would like in a different style or color. Also for Joy De Vivre readers Dawn has extended a very gracious welcome! From now until the end of the feature, (see dates below), you will receive 15 % off purchases by using the code JOY15! 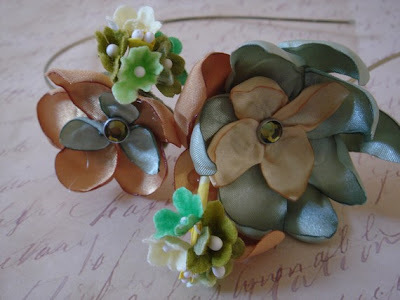 A lovely ode to spring, the hand cut and placed satin petals create a vintage flair. Mixed textures and patterns come together in a delightful way here. The neutral palette also makes it highly wearable! 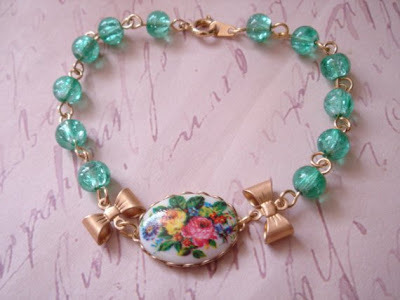 So girlie and beautiful the Sentimental Garden Bracelet is made of crackle class beads, brass bows and centered around a vintage floral cabochon. 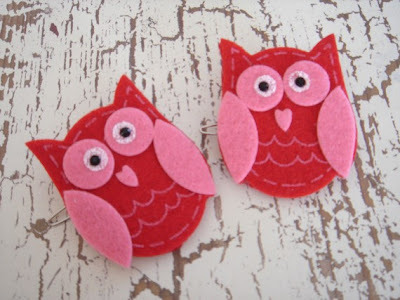 This week if you are the lucky winner of "Have You Seen This Etsy Shop?" 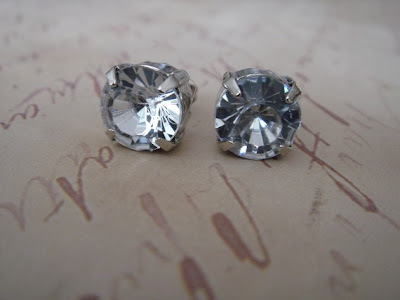 you will win a pair of Vintage Glamour earrings. The picture below is an example, however the prize pair will be of Dawn's choice, which may differ in color and style. 1. Check out Daisy Petal Designs on Etsy. Come back here and tell us your favorite item(s). 2. Be or become a follower of this blog for an added entry. 3. Be or become a facebook follower of this blog for a third entry. Since we are getting a late start this week the feature will go through April 17 at noon. Winner will be announced that night! Don't forget to check out Littlest Blooms for the cutie pies below and much, much more! 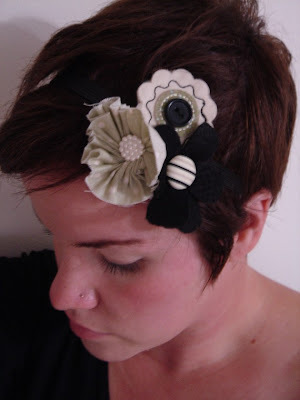 I love the Violet and Forget Me Not Headband, such an unusual color! Thanks for the lovely giveaway. i really like the flowers around y neck necklace!